This outdoor space project involved creating a happy dining space for a color-lover. 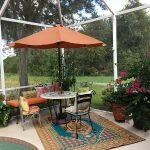 As this area was in the sun we took advantage of the opportunity to add a colorful umbrella. 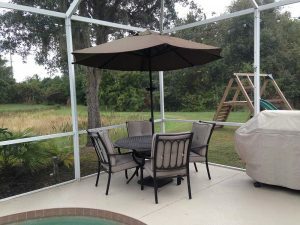 These canopies can be bought as inexpensive replacements, rather than purchasing an entirely new umbrella every other year when they tend to bleach out. Two of these vintage chairs were recovered with colorful Sunbrella print fabric, and the vintage chaise cushion was custom made. The table and additional chair were newer purchases yet the metal colors of greens and black all worked together. The corner lattice was made zip tying two inexpensive lattice arches together. Mandevilla, a fast growing flowering vine, was planted in a pretty ceramic well-drained pot. The table top is actually not faux stone; it’s a vinyl printed “tablecloth”, with hidden elastic along the bottom edge. It’s practically magical and an inexpensive transformation from a boring table! Fun toss pillows picked up the client’s favorite colors, and the finishing and most necessary item was an outdoor rug. 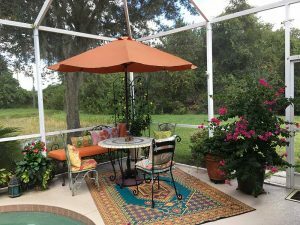 Outdoor rugs create, define and greatly enhance spaces. These are fabulous, woven out of recycled plastic “straws”, non-absorbent, come in many colors and patterns, and last for years. Placing this one on the diagonal invited outdoor lovers into the space. The end result is a delicious mix of colors and prints for this outdoor dining space, perfect for this happy client.